Outside of the few well-known, national bottled water brands like Evian, Dasani, or Aquafina, the United States is awash in smaller brands that are sold only in specific regions or states. 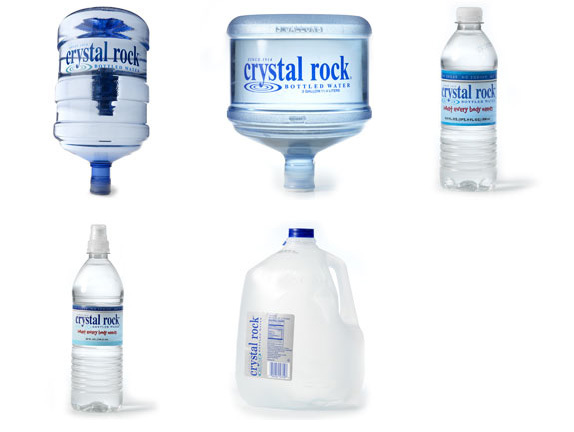 A couple of them are produced by Crystal Rock LLC, which distributes the eponymous Crystal Rock water and Vermont Pure throughout the Northeast. Crystal Rock LLC also distributes coffee of their own brand, Cool Beans, and over 40,000 office products through Crystal Rock Office. 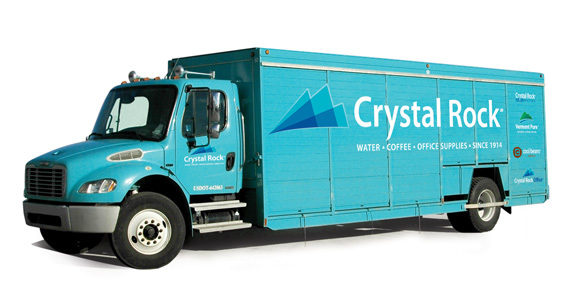 All these different products allow Crystal Rock to claim being “the largest independent home and office distributor of its kind in the United States.” Over the Summer, a new corporate mark as well as some brand extensions were created by Prospect, CT-based Worx Branding & Advertising. The biggest contribution that this new logo makes to the world of identity design is that it will rid the visual landscape of a logo that was set in Times New Roman, scaled at 75% width. Trust me, I looked into it. The old logo was bad to the last drop. The new one, by contrast, is fairly refreshing and dynamic. The three-mountain (or three-rock) icon is engaging and pretty to look at with its asymmetry and overlapping colors. The typography is a tad boring and the tapered “y” seems unnecessary, but it’s not scaled 75%, so that makes me if not happy, content. For the water bottle brand, unfortunately, the rock icon didn’t make it to the packaging. Instead, there is a very unflattering merger of the new wordmark with the old water ripple. Whatever was unique and refreshing about the new logo is completely lost in the new packaging. But things get a little better in other applications, like the uniform and the Crystal Rock Office ads. It would have been nicer to see some better integration of the identity elements across the system. 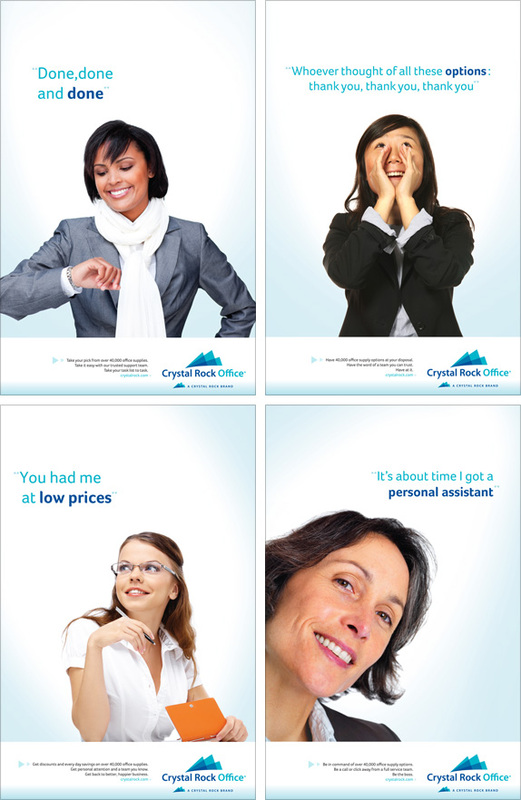 Ads for Crystal Rock Office. Outside of the few well-known, national bottled water brands like Evian, Dasani, or Aquafina, the United States is awash in smaller brands that are sold only in specific regions or states. 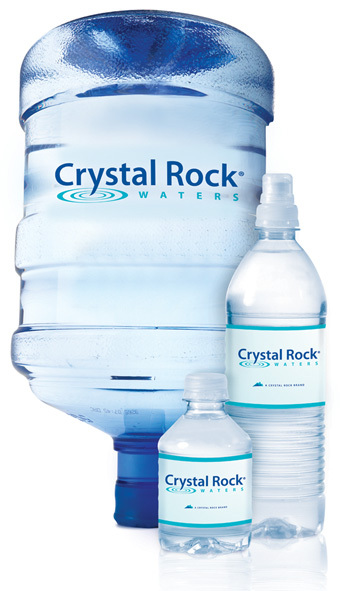 A couple of them are produced by Crystal Rock LLC, which distributes the eponymous Crystal Rock water and Vermont Pure throughout the Northeast. Crystal Rock LLC also distributes coffee of their own brand, Cool Beans, and over 40,000 office products through Crystal Rock Office. All these different products allow Crystal Rock to claim being \"the largest independent home and office distributor of its kind in the United States.\" Over the Summer, a new corporate mark as well as some brand extensions were created by Prospect, CT-based Worx Branding & Advertising.